Awesome card from Cubby5454. He is the best. Not sure why the other guy says it is valued so low considering it is a short print and consistently sells for around $125. 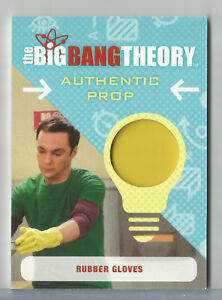 I will offer anyone who has one double what the JA says it's worth- $60 for any and all Big Bang Theory seasons 6&7 M06 Rubber Glove prop cards. Bring them on.